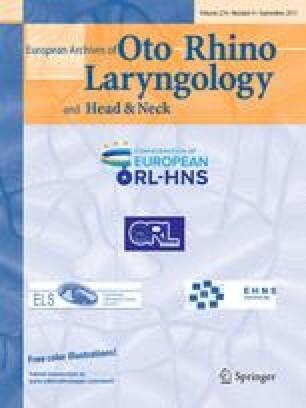 The aim of this study was to compare the audiologic outcomes of the patients who underwent endoscopy on one ear and microscopic tympanoplasty on the other, and to investigate the operative time, graft success, postoperative pain and health status. This prospective randomized controlled study was carried out in Ege University ENT Department between February 2015 and September 2016. The patients who had bilateral chronic otitis media, normal middle ear mucosa and a hearing loss difference of 10 dB or less between the two ears randomly underwent microscopic tympanoplasty in one ear and endoscopic tympanoplasty in the contralateral ear, with 6-month intervals. 13 patients were included in the study with a mean age of 36.17 ± 3.61 years (range 17–53 years, 7 female, 6 male). The improvement in air–bone gap for groups 1 (endoscopic) and 2 (microscopic) was 9.48 ± 5.23 and 9.89 ± 2.79 dB, respectively. The duration of the surgery in group 1 was significantly lower than that in group 2 (p < 0.01). VAS scores were 2.15 ± 0.37 and 3.76 ± 1.64 cm for groups 1 and 2, respectively (p = 0.006). The endoscopic approach for type 1 tympanoplasty offers shorter surgery time, better health status and lower postoperative pain than microscopic surgery. In addition, endoscopic surgery offers comparable improvement in air–bone gap and similar graft success. The endoscopic approach has comparable audiological and morphological graft outcomes with the microscopic one. The endoscopic approach yielded better health and pain status for the same patients. Level of evidence This is an individual randomized controlled trial. The level of evidence is 1b. A comment to this article is available at https://doi.org/10.1007/s00405-017-4778-2. The ethics committee approval was received for this study from the ethics committee of Ege University. The authors declared that this study received no financial support.